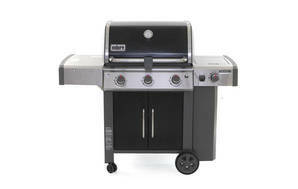 Snapshot: A patio (deck) barbecue that has a medium-sized cooking area with a sideburner. How well does it cook? Very good chicken wing cooking. "Weber® Genesis® II LX E440 Premium"
02 Feb 2019, Iain F.
not this bbq but worth considering. this bbq does not come with the rotisserie or igrill bundled, for the same price as adding the items you can get the e440 premium. the e440 hadled 40 sausages for a birthday party with ease, we turned over the plates and they hold the sausages in place perfectly back to front, no rolling, no flareups. It warms up in 30 seconds. cleanup is easy, the fat all runs into a tin tray. Wife never used old bbq, to hard to start, this one you turn the nob and it starts. Highly recommenced gatmans silverdale, other webers outlets where not as helpful or attentive. dont leave it with all elements going or it will hit well over maximum temp in less than a minute. Gas bottle gauge is not perfect. 11 Nov 2017, Craig W.
Great flavours - can cook a whole roast lamb and a chicken and the veggies... great for family cooking. Side burner is really handy. It’s big. Too big for just bacon and eggs for two people - by the time it preheats for 10 minures etc. that’s a lot of oven space for a wee bit of food. it is big to move around too - but ours has a cover on and stays in pretty much the same spot. It’s a Weber not a grill - needed to get our head around this.